Combat: This is an overall rating of how powerful the unit is. This is based on algorithmic computation of stats like damage, range, etc. It could be wildly off, because the algorithm might be over/under count certain features. Take it with a grain of salt. Total Work: This is the total number of work units required to build 1 unit of this type. This includes work units required for any resources required. This is an accurate value. Ratio: This is just a ratio of the combat rating over the total work. Higher numbers mean the unit could be overpowered. Lower numbers mean it is underpowered. Again, all this relies on an untested algorithm, so use this as a hint, not an accurate value. Note that these appear to all be for minerals at "major" deposits. The ratios change somewhat if you are getting minerals from "abundant" deposits. Yes, you're absolutely right. These are in absolute units that ignore productivity (and major deposits have a productivity coefficient of 1.0). I think your charts are useful to understand the range of costs: units that require more resources, benefit more from abundant worlds (and suffer more from unproductive worlds). Moreover, low-tech empires are less affected by having to make do with marginal worlds. At some point I suggested that low-tech units should have minerals be a higher proportion of their total cost, but I am not sure that I still feel that way. 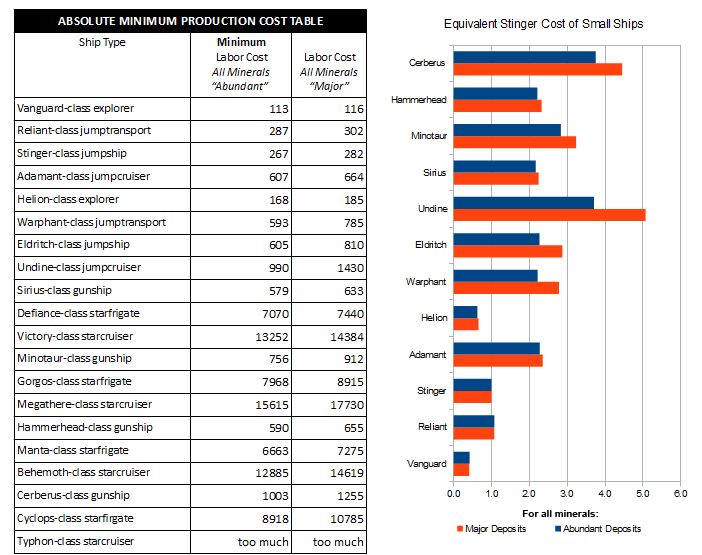 A major disadvantage of having low-tech ships be more directly labor intensive and less distributed-labor intensive is that a committed low-tech empire must consolidate many small fleets of low-tech ships, compounded by the slower speed of low-tech ships. By contrast, in a large high-tech empire most of the worlds are resource worlds and don't require much player interaction once they're set up. Some sort of unit rallying system (eventually) would address that pretty well.